Get a sneak preview of one of the 2019 Rocky Mountain Green sessions. With ever-evolving iterations of LEED and with newer rating systems such as WELL, you want to be fully prepared to meet or exceed expectations for any project that comes your way. If you’ve ever worked on a restaurant or project that includes a commercial kitchen, you know how complicated your typical submittal process can become. You’re not alone—commercial kitchens are commonly misunderstood space types that can cause project teams to lose essential points when they are going through strict applications. On April 11, at Rocky Mountain Green (RMG) in Denver, you can learn more about how to tackle the factors involved from Julie Edwards, Director of Sustainability at OZ Architecture, and Tarah Schroeder, a food service consultant who lives and breathes restaurants and is the Executive Principal at Ricca Design Studios. 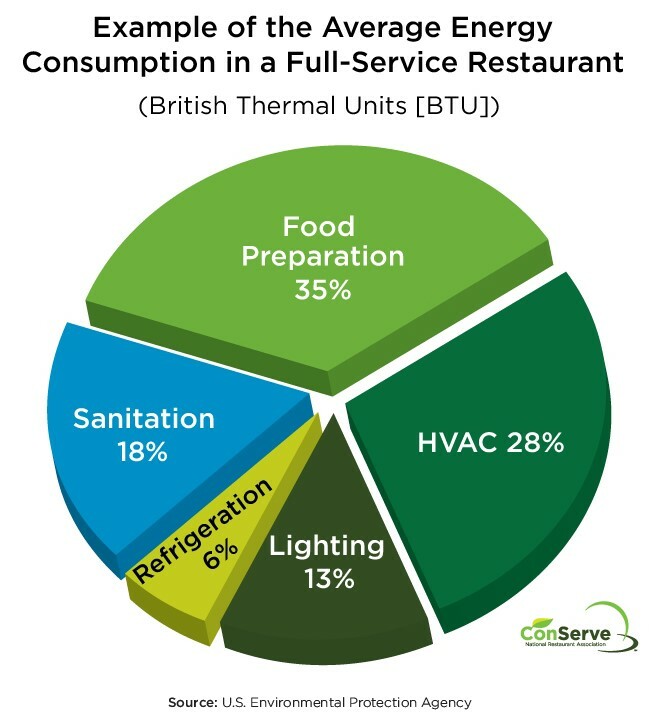 Did you know that food service buildings are the most intensive users of overall energy, using 5–7 times more than any other space type? Within that number, HVAC accounts for 28 percent of all energy use, which is primarily associated with the exhaust hood ventilation system. Image source: U.S. Environmental Protection Agency. Both WELL and LEED require teams to look closer at the exhaust hoods, for both energy and overall occupant health. A design team can use various strategies to reduce CFM of an exhaust hood, which in turn reduces overall HVAC energy consumption. These strategies include variable speed fan control (now mandated by California Title 24), using wall hoods versus island hoods (because island configurations require twice as much CFM to accurately capture and contain grease and smoke effluent) and an intentional selection of low- to medium-duty equipment located underneath the hood. WELL focuses more on improving indoor air quality by providing design guidance on appropriate hood sizing and placement, make-up air velocities and grouping equipment with similar effluent production together. Although water credits that include food service equipment for LEED seem straightforward, there can be challenges if the food service team isn’t brought into the conversation early. For example, ice machines must be Energy Star or performance equivalent, and must use either air-cooled or closed-loop cooling for the Indoor Water Use Reduction LEED prerequisite. However, air-cooled ice machines require 10 times more air circulation than water-cooled ice machines, so a change down the road can be difficult for the engineering team to design around. Food recovery is a topic that every commercial food service or restaurant project should be talking about, because there are many options available for waste diversion. 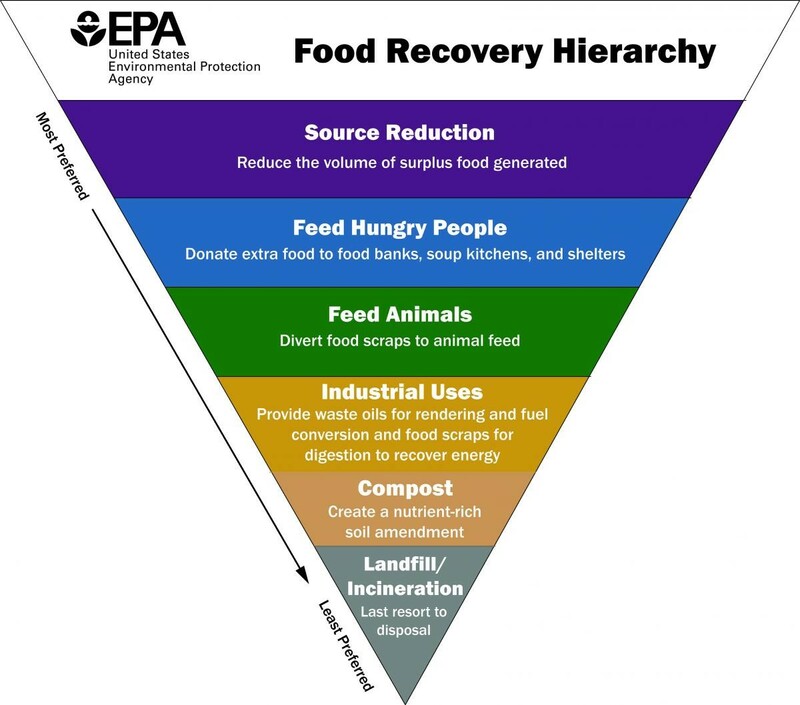 As an easy guide, the U.S. EPA has clearly outlined a hierarchy of where to start looking when reducing food waste to landfill. Successful waste recovery programs are dependent on staff behavior change and creating a path of least resistance that makes recovery convenient and won’t disrupt workflow. The WELL v1 rating system has a commercial kitchen pilot exclusively focused on this project type. Project design often focuses on the occupant experience of groups other than the kitchen staff—hotel guests, restaurant clients, school administrators and students—ignoring the health and comfort of employees who work in the kitchen all day. The WELL and LEED rating systems ensure that kitchen staff also have access to good indoor air quality, daylight and views, individual thermal controls, quality lighting and ergonomic standing support, among many other health and mental well-being strategies that can be incorporated. To learn more about commercial kitchen sustainability strategies, join Edwards and Schroeder as they bring their knowledge of the topic to Rocky Mountain Green. Both experts will engage with a variety of disciplines in the audience of their education session as they take a deep dive into the sustainability issues commercial kitchens face and answer questions from the audience. This session has been approved for LEED AP BD+C, LEED Green Associate and WELL AP continuing education credits.